Torque Rods | ATRO Engineered Systems, Inc.
ATRO's truck and trailer torque rods combine innovative engineering and physically superior polyurethane bushings. ATRO's rods are engineered and constructed to meet or exceed OEM standards. The combination of polyurethane material, mechanical welding and forged eye components creates a better torque rod. Most rods feature ATRO's free-rotation bushings - an outer metal sleeve with a rotating inner sleeve/pin. This free-rotation design with ATRO's specially designed polyurethane eliminates the windup and walkout rubber bushings experience, last longer than OEM bushings, put less stress on other suspension components, and simply keep your trucks out of the shop and on the road. This design makes rod installation easy as they automatically zero out to ride height and eliminate the clocking positions. ATRO's proprietary polyurethane bushings are chemically resistant to contaminates such as road salt, grease, oil, acidic cleaning solvents, hydraulic fluid and diesel fuel and feature significantly higher tensile strength and tear resistance than OEM rubber or other polyurethane bushings. 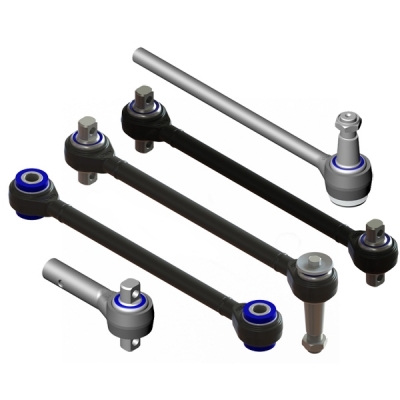 Combine this with the fact that ATRO bushings require no maintenance or grease and you get torque rods and bushings that outperform and outlast OE or other replacement rods and bushings, resulting in less downtime and lower cost-per-mile. 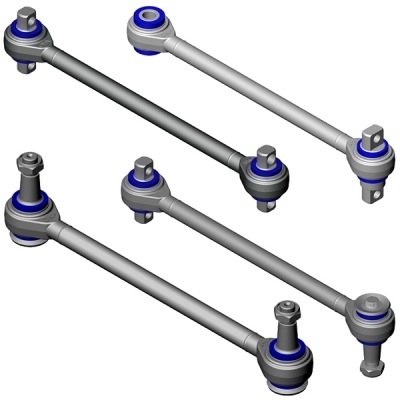 ATRO's torque rods are more robust than OEM rods, and are available for almost any suspension. 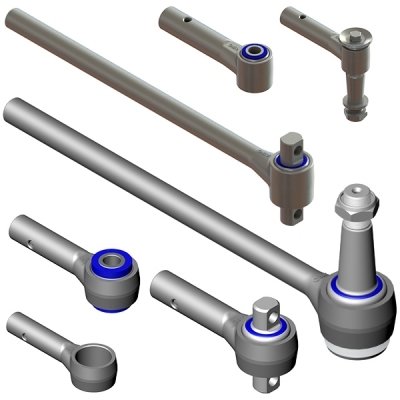 These include fixed length and adjustable length rods, lateral rods, radius rods, V-rod assemblies, small eye rods, and custom length rods where you specify center to center length of rod. The ATRO name was built on torque rods and bushings, and we continue to lead the industry in POLYURETHANE*SOLUTIONS. Find your rod fast at Torque-rod.com.